BSNL is most used Landline and Broadband service provider in India due to its cheaper rates and various plan options. We already told you HOW TO VIEW AND ONLINE PAY BSNL LANDLINE AND BROADBAND BILLS WITH 1% DISCOUNT and How to view BSNL Broadband Usage online. But with above method you can not view your BSNL Bill (Landline) online, So in this step by step tutorial we are going to tell you How to view BSNL Bills online.You can also view all BSNL call details for the last month and the detail call summary. Fill Your Customer ID and other details. Your BSNL customer ID can be found in Your monthly bill as highlighted in yellow in below figure. 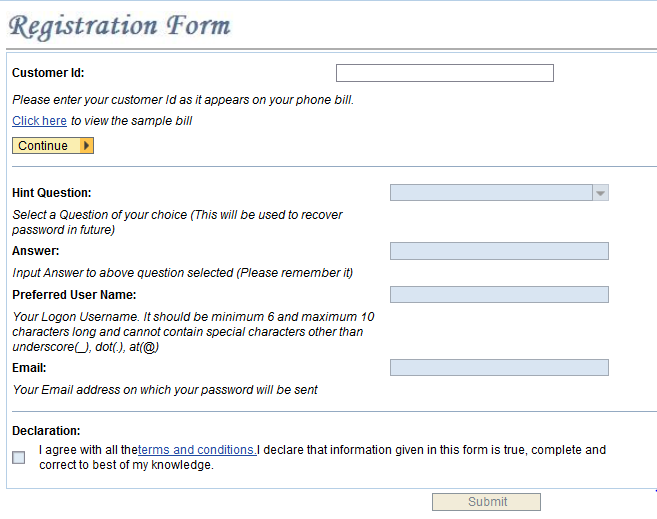 After filling all details and selecting the declaration check box, click on submit button. You will receive your username and password on your registered email in 1 to 3 days from BSNL Webcare. After receiving your username and password Login BSNL Webcare website by clicking here. Click on My services>>View Bills link from left sidebar. 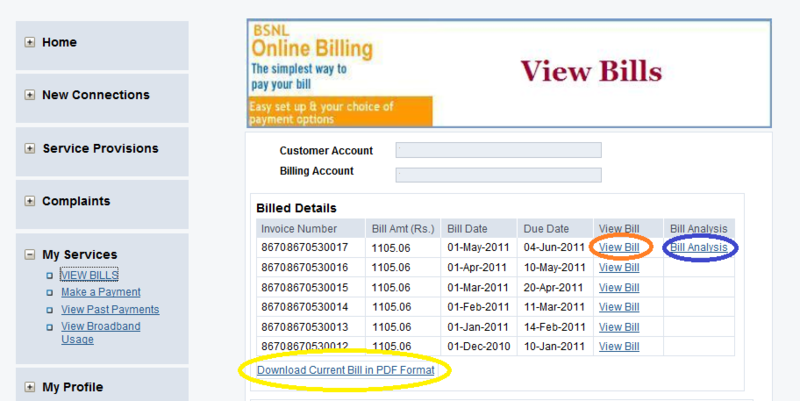 Now click on View Bill link to view BSNL Landline Bill details online as shown in figure below. . If you want to download BSNL Bill in PDF format then click on Download Current Bill in PDF Format link. You analyse and view all BSNL call detail by clicking Bill Analysis link and various option are available for call detail analysis as shown below.You can click on any link to view and analyse BSNL Call details. . If you have any issue to Download and view BSNL Bills online, then please ask in comment section. Thanks for sharing the info. I could not find this info on BSNL website. Google helped me to reach your post. I’ve registered my customer id with them for online services. After submitting, it says an agent will give a call to verify the details. Lets see how long it takes. not getting thro post for the last two times. please send a call details of tel.no. 08362225455 from jan 2012 till date to my e mail id. or please tell how to download registration form for the same. Is this post still valid, it is giving “Please enter a valid customer Id”. Yes it is still valid, many people using it, please check yor customer id. Thanks for the post. I dont have a customer id in my monthly bill ? How do i get it ? 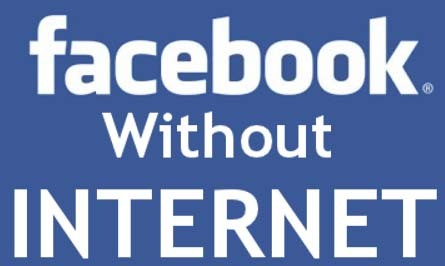 Can i get that online thru bsnl website ? What is the link for Registration form page? thanks for the link given to view the online details for BSNL landline but let me bring to your notice that though I have created my account on BSNL portal, it only shows the payment of bills – online option not the details of it and more over the link you have provided opens but it doesn’t accepts the given customer ID! I want to check online bill details of landline no. How to get registration form to view the details? online call details processs its Not Working …. pl send the monthly land line -080-23215721 to this mob ile as well as email. I AM NOT ABLE TO VIEW BILL ANALYSIS ONLINE ON BSNL WEBSITE. Hi, is there a way to know the customer number or account number without the bill ? I got the landline connection last month but have not yet got the bill. Without seeing the bill, how can I get the account number using the landline number ? I came to know that BSNL is not good in sending the bills properly and that we have to take care of it. kindly provid the last Bill ditails ( call ditails ) for below my Teliphone Number. I am not able to view the bill analysis of my bsnl landline on the website of bsnl. I am able to go upto the view bill option. But after that when i click on the bill analysis it says the bill is not yet generated. can u help me how to solve this problem. this is the same problem i m facing ..
will the bill analysis will be shown after certain interval becoz i have created a new portal account??? Thanks for this information and links which are very clear. I really admire your patience. the number of dumb people asking you to send them their mobile or land line bills is ridiculous..i would have lost my cool long back. 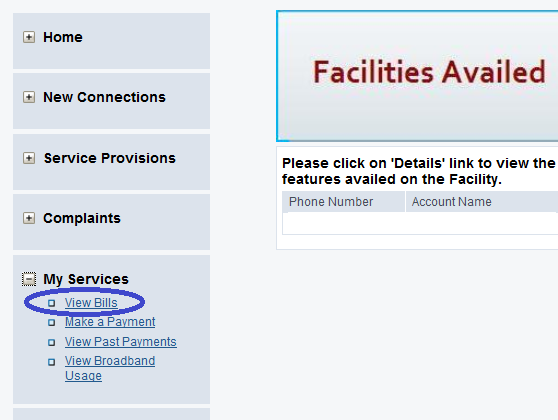 People : Techstic cannot send you your mobile bill or landline bill..you have to visit the bsnl website mentioned ABOVE in teh TUTORIAL and register yourself…then ONLY YOU can view your OWN BILLS. stop asking techstic to provide you with your bill. He/she CANNOT DO IT.! 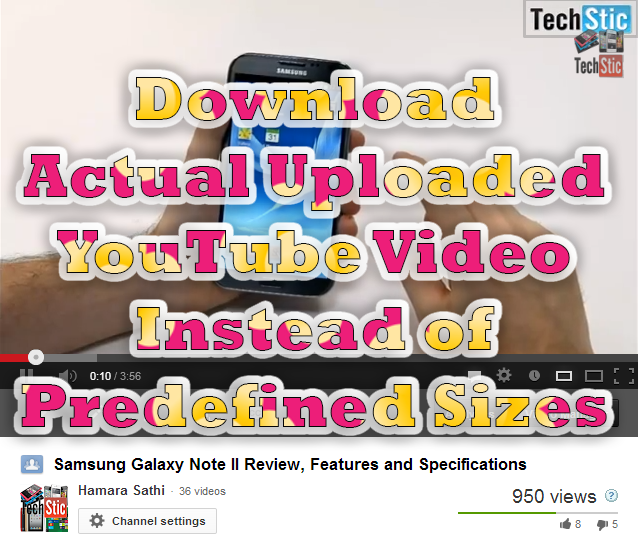 Thanks for sharing this techstic. I GOT THE PASSWORD WITH IN 24 HOURS FROM REGISTRATION BUT AFTER LOGGING IN IT SHOWS THAT USER AUTHENTICATION FAILED. PLEASE GUIDE. AGENT HAS NOT CALLED YET FOR THE VERIFICATION. Great going Techstic. I followed your instructions to the letter and managed to get my login in BSNL Webcare and have been able to download the last bill which I needed. I really appreciate the assistance & patience in guidng us. Wishin you all the best & once again a mighty thank u!!! CHEERS!!!! Thank you very much for the detailed instructions to download the past BSNL telephone bills. Even though, it took some time for me to figure out where is what, due to change in the GUI, finally it worked for me. It is great to see many details, which I was always wanted to see from many years :-). thanks a lot for sharing this information. I have requested for registration and as a reply the message was password will be sent after verification. I am a user of Uttaranchal circle of BSNL. I would like to know whether this service provides the incoming call details as well? I would be thankful for your reply. You can check your call details, in call analysis section. Hi, thnks for the information. but m not able to analyse the bill, when i am clicking on the link analyse bill, there is no result, it stuck on the same same page..
please let me know how can i see the call history…plzzz its urgent..please guide.